I’ve been quiet. Like super quiet for the past week, only because I’ve been working on something awesome .. So, what’s so amazing I hear you ask? 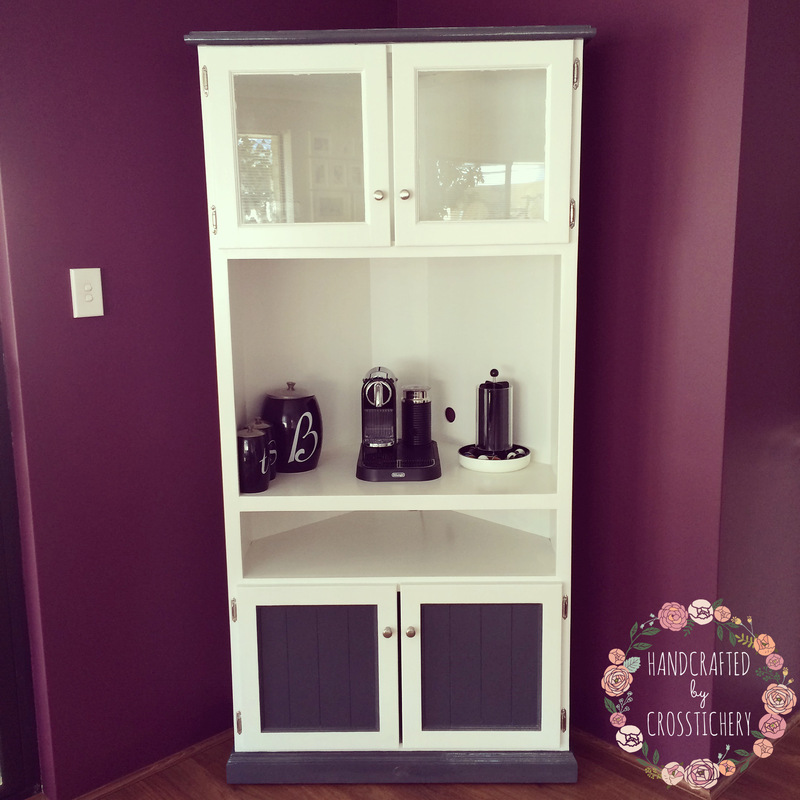 I upcycled a pine corner TV unit into a chic DIY bar / coffee station! Mr A and I have quite an awkward corner in our house. For the past 2 years it’s been empty, and it’s the last space in our house that needs to be completed. On our house plans, they had the corner as a bar, but it would’ve been ridiculously small and not usable, so I decided to recycle a used pine TV unit and turn it into a bar and coffee station. I did a bit of research online and knew that I wanted our bar to be white. 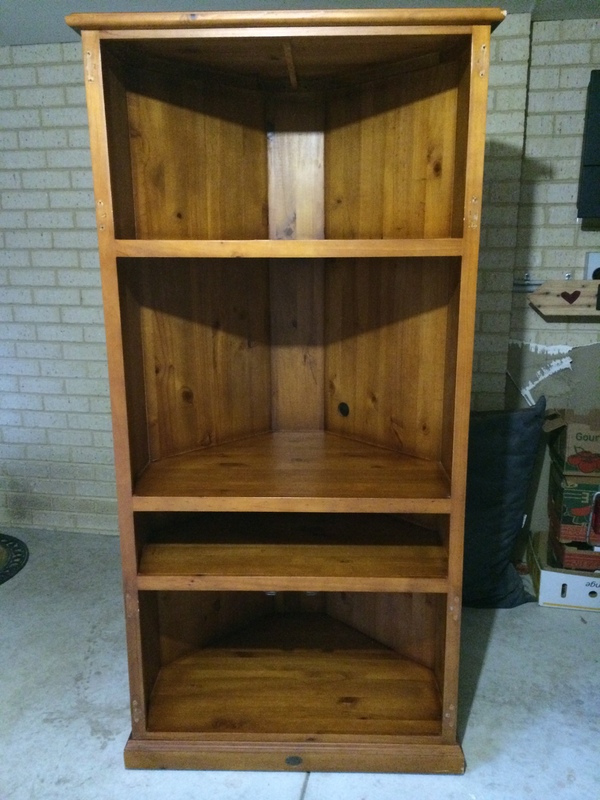 I search our local thrift shop website (Gumtree, for those of you in Australia), and found the perfect unit for $100! So I got to upcycling. This is what the unit looked like to before. It was pine, and quite thick wood. Having done some research, I thought I had to sand back to get rid of the varnish, and then prime and undercoat the wood prior to painting. Thankfully though, I spoke to a handy friend of mine who told me Taubmans (paint brand) makes a 3 in 1 paint so that you don’t have to sand! 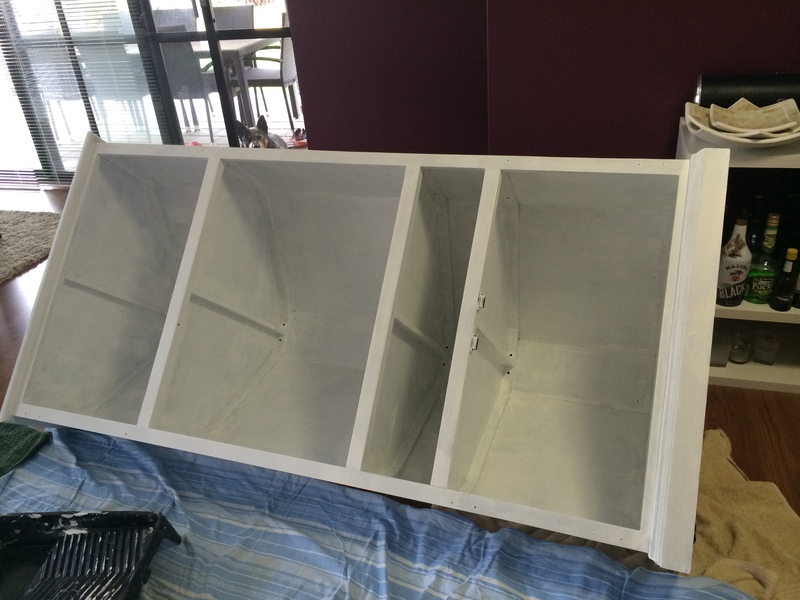 SUCH a great idea, as it combines a primer, undercoat and sealant all in one! I didn’t need many supplies for this one. Just a paint brush, paint roller, paint tray, 3 in 1, screwdriver, masking tape, and final paint colour. This before shot is after I took off all the doors and the door hardware. I definitely recommend doing so, as it’s pretty tricky to get into all the spaces you need to. 2 coats of sealant took about 2 days to do, including drying time. During this time, I was just imaging all the things I would put into it which kept me motivated hehe! At this stage the unit was in our garage, but we got some really rainy weather so I ended up moving it into our living area. I found it really hard to get into all the nooks and crannies whilst the unit was standing up, so I laid it on its side which was SO much easier, but definitely took up more space – my back was really thankful for the swap though! I had originally intended to keep the whole unit white. But whilst I was painting I decided to want to do the trim in a dark grey. We have a few grey tones in the area, and it seemed like a nice idea at the time .. Until I actually had to paint it! If you decide to do something like this at home, PLEASE, I beg you, use some good quality tape! I didn’t to begin with, and you can see the grey bled into the white, which meant I really carefully had to go back over with white 2 times, to cover the grey. Once I saw the paint bled, I bought some new good quality stuff and it was all okay – thankfully!! As you can see, the trim and the doors are in grey. We bought a new coffee machine, and I’m in the process of moving our alcohol, wine glasses, champagne glasses, spirit tumblers etc into the unit right now. It finishes off our corner so perfectly, and it’s nice to have some extra bench space now that our drink items are all stored here! The next plan is to add a sliding shelf to the narrower shelf, just for some extra layout space .. Particularly for those espresso martinis! Once we deck it out a bit more, I’ll show you guys a photo, just so you can get an idea of the layout. I was too excited to share this, especially as I’ve been so quiet on here lately! As always, I’d love to know your thoughts on our latest DIY addition. If you have any questions, or you’ve attempted this at home, I’d love to know how you went! Oh wowsa, very pretty :) And yes, I share your pain about using good quality masking tape… I was given the task of taping and up-taping the doors my dad was painting, all 9 glass panels on both sides…. that was not fun! What a great job! Thank you for sharing this! 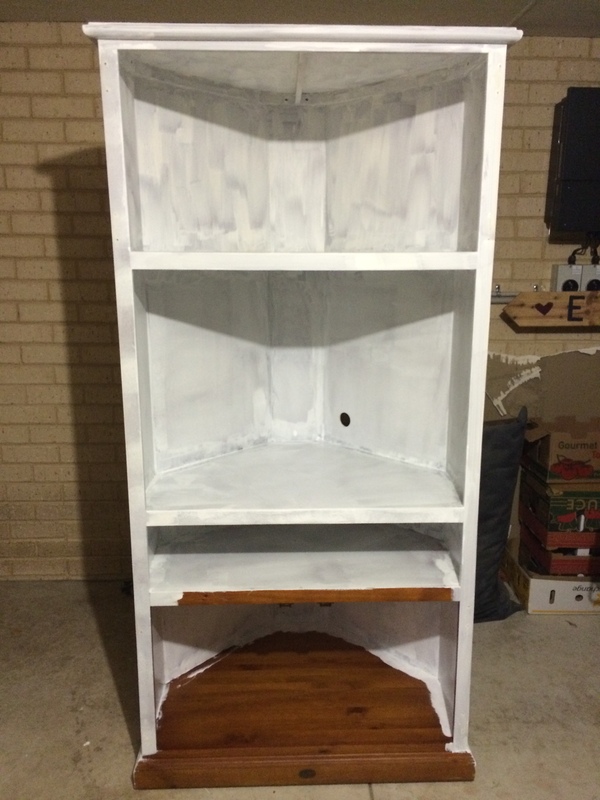 You have motivated me to do something with that old ugly entertainment center I have in my garage. I think I’ll spruce it up for my dining room! ooh that’s pretty! I have three timber units I want to paint, so I might just hunt out that Taubman’s paint. Do Bunnings stock it? Yes they do! As a guide, I only used 1L for 2 coats for my unit .. So perhaps with 3 units you could get away with 2L if you didn’t waste a lot, like I seemed to do! It’s quite pricey, but so worth I think .. Manually sanding back 1 (or 3!) units would’ve been a headache. It’s definitely more economical to buy a large quantity of the 3 in 1. 2L cost me about $48. If you’d rather not paint a top coat, then 2 coat of the 3in1 would be enough – it’s quite thick and I couldn’t see any colour undernearth once I had done 2 coat. It’s very stark white though! That turned out so well; so much patience. I can’t wait to see what the finished display looks like. Thank you so much! You’re right .. It did take a lot of patience, especially around the tricky edges. That is super cute. I really like it. One of these days we’re gonna have space to get nice furniture, especially if I can do something as awesome as this!